A lot have been said and written about paradise by the human race. Even the biblical Garden of Eden is an attempt to describe how a paradise looks like. Welcome to the Four Seasons Resort Hualalai, a resort that has been rated the Traveller's Choice 2013 by tripadvisor. A lot have been said and written about paradise by the human race. Even the biblical Garden of Eden is an attempt to describe how a paradise looks like. 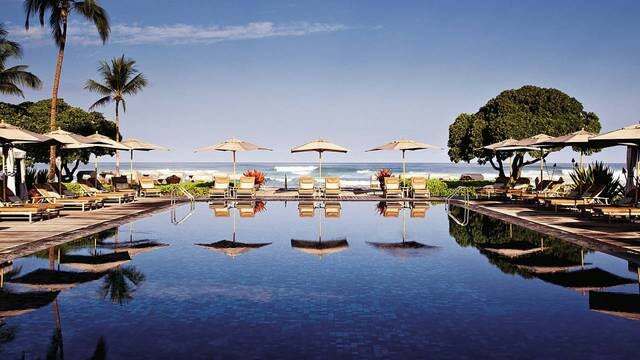 Welcome to the Four Seasons Resort Hualalai, a resort that has been rated the Traveller's Choice 2013 by tripadvisor and a paradise in its own right. This magnificent resort is located in the serene, surreal, and scenic village of Kaʻūpūlehu, along the Kona-Kohala coast of the Island of Hawaii. The resort was modeled by top real estate companies such as the Hill Glazier Architects for its design, Wilson and Associates for interior decorations and Bensley Design for the landscape. The resort boasts a whopping 243 rooms, 51 of which are suites. The resort does not have a high rise. All its buildings are bungalow-styled houses that are connected by paths that run along turquoise, crystal clear pools. The guestrooms are decorated with indigenous rattan, bamboo and lava rocks from the nearby Hawaii Volcano National Park. If you have never experienced some gourmet dining, sample this; all the menus in the resort are prepared using locally available ingredients including avocado, goat cheese, red and yellow tomatoes, mushrooms, lobsters, white organic honey, and baby abalone. The resort boasts 3 restaurants including Hualalai Grille, Ulu Ocean Grill and Sushi Lounge, and Beach Tree Bar and Lounge. The icing on the cake that makes the resort better than the rest of the top 25 hotels listed by the tripadvisor is its 28,000 square foot spa. Among the services offered at the spa include massage and facial services such as aromatherapy, craniofacial therapy, deep tissue therapy, hapai therapy for pregnant ladies, and lomi lopi healing therapy among others. Another magical experience you will get at the spa is the body treatments that include hau'oli wawae foot, neck and scalp treatment, Polynesian niu coconut scrub, sun relief ti leaf wrap, Island glow etc. The resort also features wellness programs such as health and fitness services, and nutritional services. In addition, they offer beauty services such as salon and treatment packages. For those who love the outdoors, you can play your favorite game of golf at the resort’s own 7,100 yards golf course or go sightseeing to the nearby Akaka Falls, Hawaii Volcanoes National Park, City of Refuge among others. You can also soak in the rich Hawaiian sun at the Hipuna Beach or hike to the Ka Lae South Point and Waipi'o Valley. The beauty of Four Seasons Resort Hualalai at Kaʻūpūlehu is my idea of paradise. If there is any place more beautiful than this resort and its surrounding, then I would love to know so that I can upgrade my imagination of paradise. Until then, Four Seasons Resort Hualalai it is!